Missing teeth can make you look years older than your chronological age. However, did you also know that missing teeth increase your risk for further tooth loss, jawbone deterioration, and facial collapse? As dental implant dentists, we look out for your oral health so you can continue smiling with confidence. Continue reading to learn why we may recommend dental implants to protect your health. 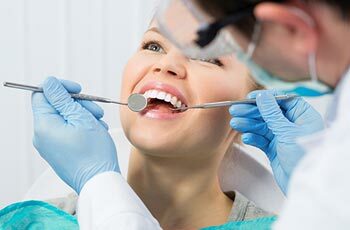 To learn if you’re a candidate for dental implant surgery, you’ll need to schedule a consultation with one of our dentists. We look forward to hearing from you! Your teeth are held in place by roots and surrounding teeth. This means that when you lose one tooth, you’re more at risk for losing subsequent teeth. The best way to stop tooth loss from getting worse is to ask your dentist if you’re a candidate for the dental implant procedure. Dental implants prevent further tooth loss by supporting nearby teeth. By giving the other teeth in your smile something to lean on, they’re less likely to become loose and fall out. Teeth that have nothing to lean on begin to tilt toward the open space unless they’re stopped by dental implants. Missing teeth puts you at higher risk for cavities and gum disease. It’s hard to properly brush and floss teeth when they’re leaning toward empty sockets. Also keep in mind that the empty sockets where teeth once were can trap food particles, bacteria, and plaque. Most oral health issues (like gum disease) are caused by untreated dental plaque. The best way to maintain good oral health is to replace missing teeth and practice good oral hygiene. Unlike other tooth replacement options, a dental implant acts much like a natural tooth root to stimulate jawbone tissue. Your jawbone needs pressure from tooth roots to stay healthy. Otherwise, your jawbone will start to deteriorate and could even lead to facial collapse. Many people with dentures experience jaw shrinkage, which drastically alters the shape of their face and overall appearance. The sooner you ask your dentist about dental implant surgery, the sooner you’ll be able to protect your oral health. Even if you don’t have sufficient jawbone tissue to support a tooth implant, your dentist may recommend a bone graft. Eating your favorite foods shouldn’t be painful. If you experience pain or discomfort while eating, call your dentist. After tooth loss, it’s not uncommon for patients to eat soft foods. When you limit your diet to avoid tooth pain, you aren’t able to eat the nutrient-rich foods you need to stay healthy. It’s important to understand how your oral health affects overall health. Your teeth, gums, and jawbones are part of a larger system. Not being able to eat a balanced diet can affect your bones, as well as increase your risk for tooth decay and jawbone deterioration. Ask your dentist if you’re a candidate for the dental implant procedure. Our dental implant dentists can help you explore your tooth replacement options so you can smile with confidence. To schedule your appointment with one of our Grandville dentists, call (616) 534-0080.